Propulsion: Two single ended boilers, one 3,300hp vertical triple expansion steam engine, one shaft. 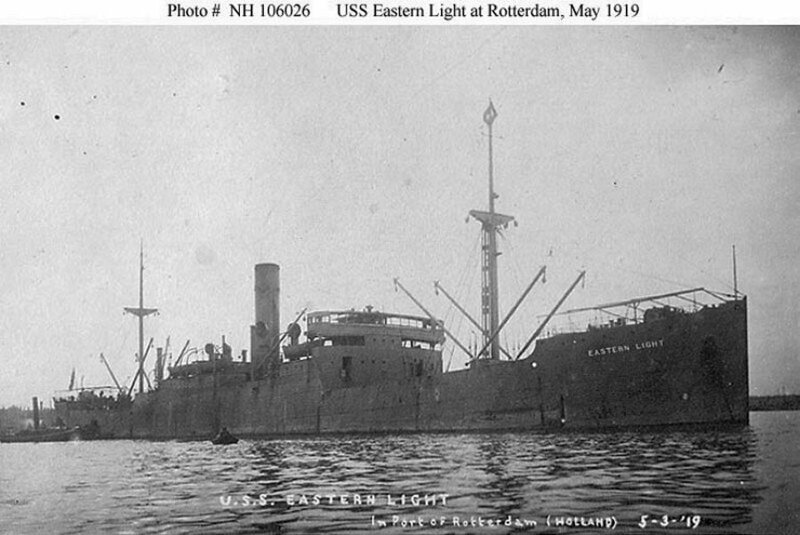 Dictionary of American Naval Fighting Ships: Eastern Light, a cargo ship, was built in September 1918, under contract with the U.S. Shipping Board, by Osaka Iron Works Go., Innoshima, Japan converted at Puget Sound Navy Yard; transferred to the Navy from the Shipping Board, 6 November 1918 and commissioned 6 December 1918, Lieutenant Commander W. [William] J. Johnson, USNRF, in command. After loading a cargo of flour and other stores at Tacoma, Washington, Eastern Light departed Seattle 29 December 1918 for the east coast, arriving at Norfolk 9 February 1919. She loaded cargo for the Food Administration and sailed for northern Europe, 13 February, via Falmouth, mooring at Rotterdam 5 March. Her cargo was transferred to barges for use by the Relief Commission in alleviating the famine caused by the ravages of war. Ballasted with sand, Eastern Light stood out for Plymouth and New York, arriving 10 April on a 16-day crossing. She was decommissioned and returned to the Shipping Board, both on 16 April 1919.